Over the past few years, Marvel has released an annual Point One special, a one-shot anthology showcasing various “teasers” of what to expect in the comics throughout the coming year. Having yet to announce one for 2015, this week’s Uncanny Inhumans #0 serves most effectively as a model substitute. Boasting an over-sized page count and a pair of back-up features, it has the ground floor feel of the “next big thing” from cover to cover. Kang also has a souffle in the oven. So, Shhhh! Usually a bad guy menacing the Avengers and Fantastic Four (and the Guardians one time during the DNA run), Kang is an unlikely adversary here. Granted, the Inhuman Royal Family doesn’t have much of a rogue’s gallery per se, as few and far between are the instances where they’ve mixed it up with an accredited supervillain of their own accord. 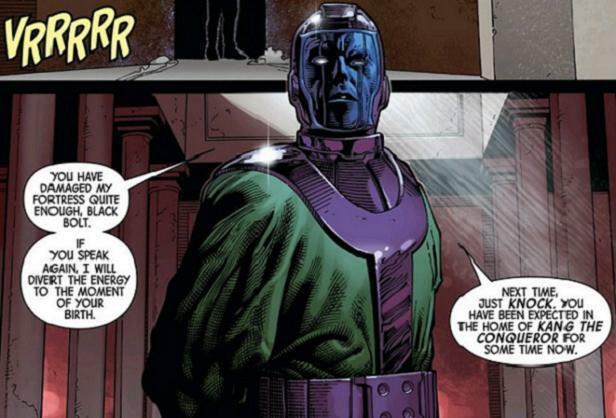 As Marvel’s premiere time-traveler, Kang’s presence and cavalier attitude toward the seemingly terminal Incursion crisis gives strong allusion that maybe things aren’t as bad as all that. 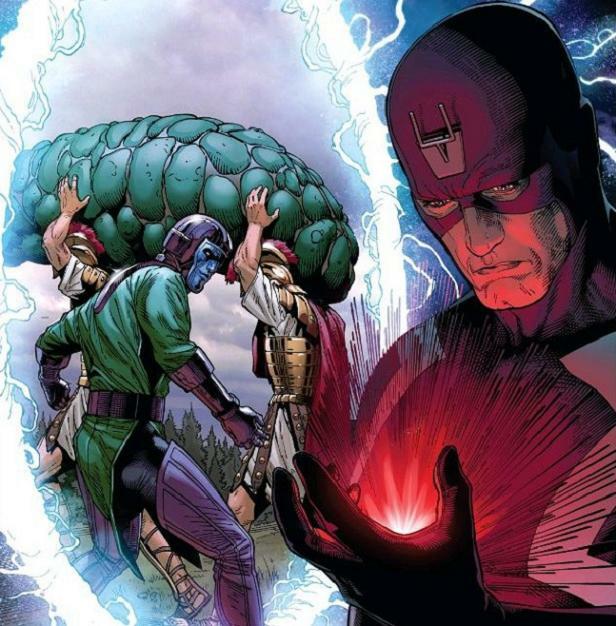 If he’s able to escape beyond the grasp of the Beyonders, surely there’s light at the end of the tunnel? Overall, the lead feature, entitled “End Times”, is meant just for that purpose: to raise questions. 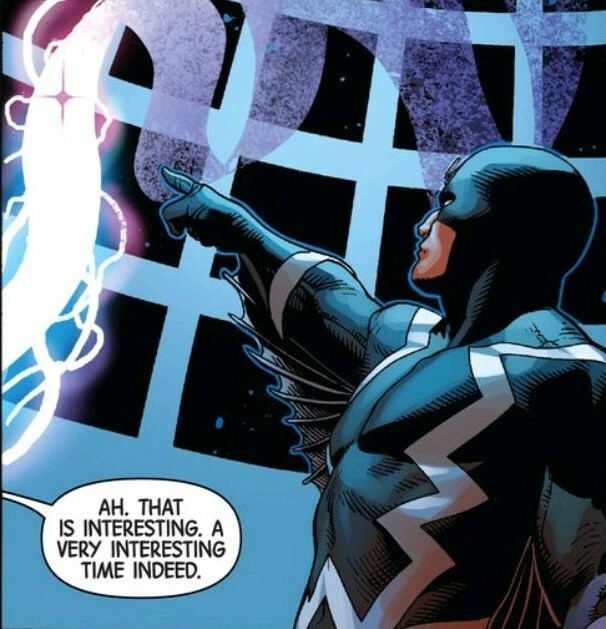 Regular Inhuman writer Charles Soule operates very much like his protagonist, exiled King Black Bolt, revealing very little yet speaking volumes in terms of projection. In no small way is the writer letting it be known that the table is now resetting for a new long-game. Joining Soule are his cohorts from the acclaimed Death of Wolverine mini-series. Artist Steve McNiven, inker Jay Leisten and colorist Justin Ponsor turn in twenty-three of their best collective pages, certainly on par with anything from their previous benchmark. Leisten brings out a rough-edged scratchiness in McNiven’s pencils which isn’t wholly unpleasant. Like Logan’s demise epic, things seem like they’re about to get a bit grizzly- so this really sets the tone. While the lead feature is indeed why we’re all here, the issue also contains a delightful five pager. Regular Inhuman artist Ryan Stegman makes his debut as writer, turning art duties over to newcomer Ryan Lee. In this short bonus, Lee and color artist evoke a visual narrative as much in the vein of Heavy Metal sci-fi as it is of the world of superheroes. The romance between Iso and Flint, two young “NuHuman” cast members (recent Terrigen converts), is also a nice grounding touch to those who may be unfamiliar with more recent additions. Whether this sort of vignette will factor in as a component to the ongoing remains a matter yet to be revealed but it’d be welcome change-up all the same. Rounding out the bells and whistles is a two page poster-esque spread by artsist Brandon Peterson entitled “Things To Come”. If the lead didn’t seed enough mystery on its own, this is bringing napalm to stoke the fire! Featuring prominent players from other Marvel franchises, Uncanny Inhumans could very well be the lead book going forward from Secret Wars. Either way, it’s a cool piece of ponder candy. 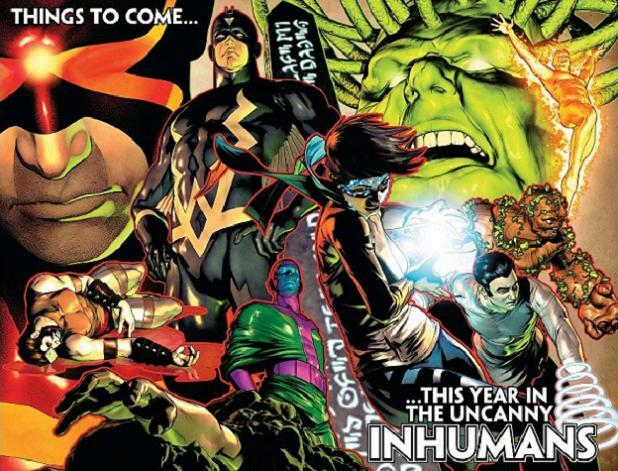 Since Jonathan Hickman’s Infinity event in 2013, Marvel has been making the Inhumans a priority. After some initial herky-jerky with original franchise writer Matt Fraction, Soule came on board as something of a troubleshooting pinch hitter. Bearing all of this preamble in mind, kicking off “Inhumans, Year Two” with “origin point” issue is still a weird choice. 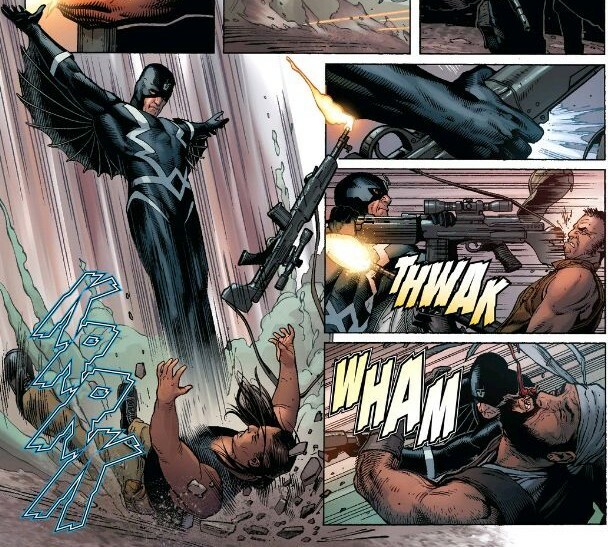 Then again, the Inhumans thrive on the weird and unlikely so this all works out. And then some. This is the perfect jumping on point for any lapsed or curious reader wanting to get in on Marvel’s other outcasts- especially as their q rating increases across all media platforms. 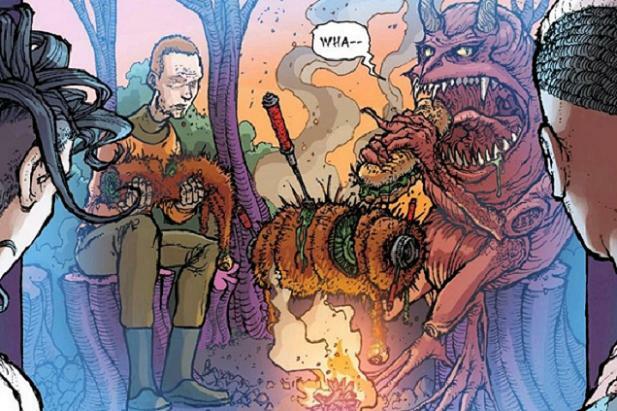 Then again, the Inhumans thrive on the weird and unlikely so this all works out. And then some. This is the perfect jumping on point for any lapsed or curious reader wanting to get in on Marvel’s other outcasts- especially as their q rating increases across all media platforms. If I didn’t have to “work” to “earn a living” and spent all my time on Comic Book Herald, you can bet your bottom dollar we’d have an Inhumans Q Rating weekly feature (so hot right now. so hot.). I really enjoyed this issue, and have been pleasantly surprised by Soule’s Inhumans up to this point. If they’re going to be the mutants of the MCU, they’re actually in a really great place to do that. I too am intrigued by the Kang conundrum. Is he just sidestepping the Beyonders like a young Barry Sanders? He seems too important to ignore, especially given the time-trinity’s appearance during those Original Sin / avengers issues.